The thought of Japan brings to mind a homogeneous culture that has long valued the collectivist community as a core to the identity of being Japanese. No further does one have to look for an example of this mindset than the game of baseball. A few of us decided to attend a pro baseball game in Tokyo – the Hanshin Tigers versus the Tokyo Yakult Swallows – and the experience was unlike any Major League game I have attended in the States. The second we stepped into the seats of Jingu Stadium, we were bombarded with masses of Japanese fans all wearing the same jerseys, chanting the same chants in unison, motioning the same directions, responding to the same cues. It was fascinating how perfectly harmonized the fans were in tune with each other; it was as if the collective crowd had a singular mind. If I didn’t know better I would almost say it looked militaristic. But what it really was, was a perfect reflection of the collectivist cultural value has long been integral to Japanese identity. George Simmel’s definition of The Metropolis as “the most punctual integration of all activities and mutual relations into a stable and…. precisely schematized form of life” has no better example than that of these Japanese baseball fans behaving in such a homogeneous way. This pervading collectivism is represented not just in this cultural realm of baseball, but manifests itself in the built environment around us. As I sit and write at night in my 30-story high hotel room, the view of Tokyo is a dense collection of white lights that define building forms and outlines. Each mid/high rise building has on its roof a series of identical red blinking lights. No doubt this serves a functional purpose – my guess would be that they exist to warn incoming helicopters or planes at night of relative building heights – but what is more evocative is how as a single collective mass, the red lights on each building at night evoke an image of this metropolis as a gigantic living organism. Red lights that turn on and off together and define the Tokyo skyline also represent the organic collective mindset so core to the Japanese identity and to the idea of the Metropolis. Just as the crowd of fans at the baseball game behaved as a homogeneous collective whole, so does the Metropolis consisting of buildings – the man made objects that stem from this society – behave in the very same way. Switching back to the topic of baseball, I took an image of an especially ardent fan at the stadium waving, of all things, an American flag. This reminded me that baseball was originally an American sport brought to Japan, and led me to consider the topic of assimilation in Japanese culture. If I can recall from history class, the Japanese culture contains a very real capacity for rapid, pragmatic adaptation. Historically, the transformation of Japan into a modern political and social metropolis during the Meiji Restoration ended the reign of the Shogunate, and ushered in a complete assimilation of Western political, social, and industrial hierarchies. The same thing happened with baseball, albeit with no bloodshed or rebellion. Baseball, originally a Western construct, has been completely assimilated by Japanese culture. From a Western point of view, it was almost amusing to see this pseudo imitation of Americana, much like Tokyo Disneyland or Elvis being blasted and danced to on the streets. But as a student of architecture and urbanism, I now begin to question the very idea of assimilation and whether what is ‘assimilated’ and spit back out even resembles the original. 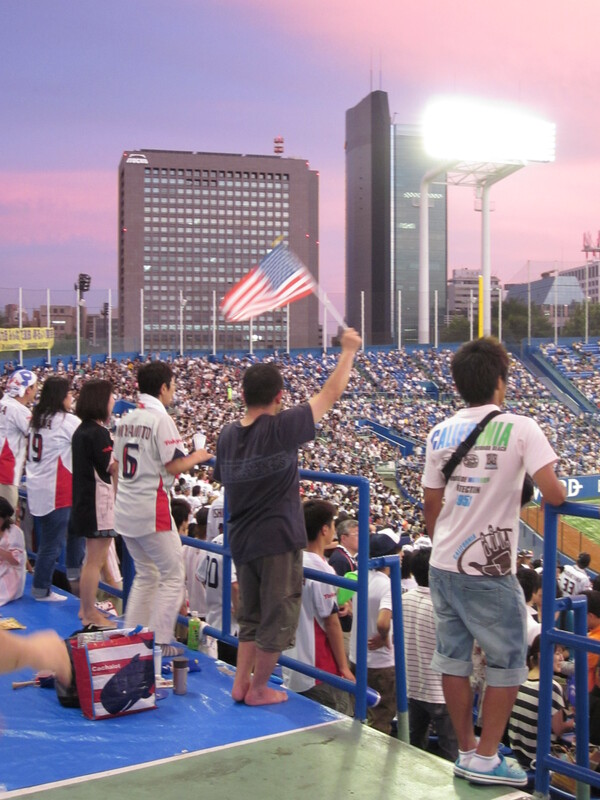 Here we are witnessing: a Japanese baseball fan, waving an American flag, in a Japanese crowd, watching an ‘American’ sport, being played and experienced in a distinctively Japanese way. The Japanese songs, chants, sportswear and collective behavior of the crowd as one homogeneous mind can nowhere be found in baseball games in the States. Baseball in Japan has become uniquely Japanese. By the bottom of the 7th inning, the score was 8-3 Tigers, the Swallows would probably lose. We were seated in the losing teams section and I expected fans to start leaving early, cheers to die down and chants to be recited with less and less fervor. But the opposite happened, fans stayed put and sung and chanted just as loud as the opening pitch. It was then that I realized that it wasn’t about the score anymore, it wasn’t about winning or losing. In America, the idea of victory and defeat is so engrained in our minds, but what I was witnessing here was a collective group of people and their respective culture that was more concerned with the passing of time (like those Pacinco parlors) and with losing themselves in the sport (like those high-rise golf ranges). I would argue that this is the essence of Japanese baseball at its most pure, and in a larger sense, the essence of The Metropolis at its most blase’.